I am using the latest EF (not EF Core). My DbContext class is in squashspider.dll. I leave "via the parameterless constructor" selected. if I click on Test then it times out. of course there is no file at that location. Or is it supposed to be creating a file at that location? I thought it might be because I am not running LINQPad as administrator and it is trying to create a file in a restricted area. How are you supposed to hook up to your program's specific DbContext? 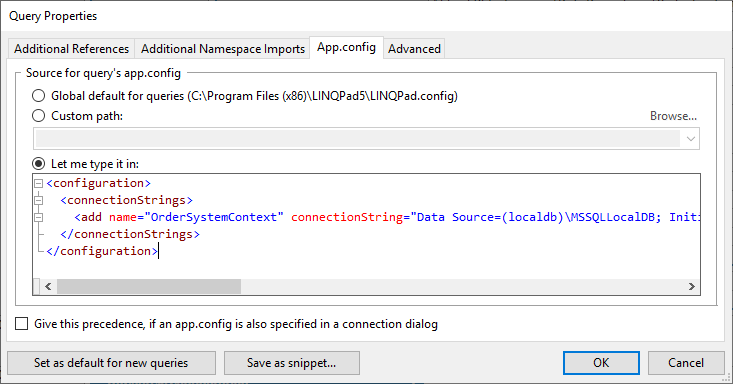 In your typed datacontext in squashspider.dll, how does it find the correct connection details when you run it in Visual Studio? SqlException: Cannot attach the file 'C:\Program files(x86)\LINQPad5\OrderSystemContext.mdf" as database 'OrderSystemContext'.